My style varies quite a bit, but is generally quite elaborate and detailed with lots of smaller elements 'hidden' in the main piece. My main source of inspiration comes from Nature and also horses. I make a lot of equestrian themed jewelry. 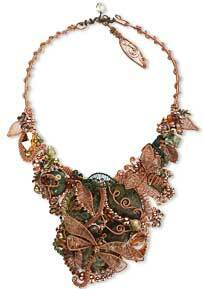 I'm also inspired by the materials that I use such as beautiful gemstones in rich natural color schemes. My favorite material is wire, mostly silver and copper. I also love working with gemstones, metal and Swarovski crystals. My life-long love affair with horses inspired this piece. When I was a little girl I used to dream of owning a horse one day so I dedicate this piece to all those others who dream of horses. I didn't start off with a plan, but the piece did develop and come together as I was making it. I began making jewelry around 4 years ago. I started playing around with some beads that I'd bought for my mum and I was hooked. Once I discovered wire, I found my true passion with jewelry. I introduced myself to beading and am self-taught. My mother is very artistic, so I was always exposed to artistic things although I wouldn't consider myself an artist. 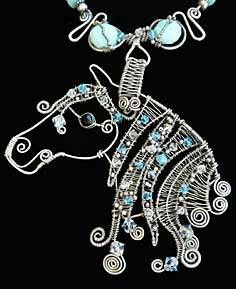 I was searching for horse beads a few years ago and came across Fire Mountain's web site. I was blown away with the selection and I've been a customer for some time now. You can't beat Fire Mountain for customer service. Packages arrive in Australia only a few days after ordering and the staff are the best to deal with! 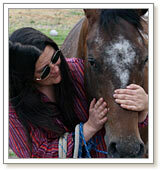 My favorite pastime is spending time with my horses and my dog. They help keep me centered and in the real world. I appreciate their wisdom and honesty. I belong to the Beading Forum (www.beadingforum.com.au) which is a great place to chat with fellow beaders and find out what is going on in Australian beading. For me jewelry making is a hobby and helps me to wind down and relax when I'm not working. Just go for it! Try lots of different things and work on developing your own style. View all of Liz's designs in the Gallery of Designs.